The NFL Physicians Society (NFLPS) congratulates Dr. Matthew Matava, M.D., former president of the NFLPS, for being recognized at the prestigious Enshrinement Ceremony at the Missouri Sports Hall of Fame on November 4, 2018. 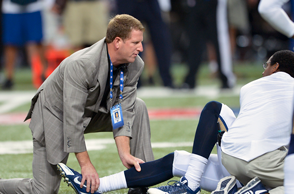 Dr. Matava will be inducted for his accomplishments in sports medicine, primarily for his nearly 20 years of service as previous Head Team Physician for the St. Louis Rams. Matava, who is Chairman of the NFL’s Committee on Research and Innovation, currently serves as a professor for orthopedic surgery and physical therapy with Washington University Physicians and is a team physician for the NHL’s St. Louis Blues. He is certified by the American Board of Orthopedic Surgery. Dr. Matava received his medical degree from the University of Missouri, Kansas City, and completed his residency at Emory University Affiliated Hospitals. After finishing his residency, he completed a fellowship with the Sports Medicine & Arthroscopic Surgery, Cincinnati Sports Medicine and Orthopedic Center. Every year since 1994, the Missouri Sports Hall of Fame hosts special events for Missouri and its sports community. The annual Enshrinement Ceremony inducts exceptional Missouri athletes into the Missouri Sports Hall of Fame, which celebrates the accomplishments made by athletes of the past, while inspiring future athletes to succeed.